First anniversary gifts are traditionally supposed to be made of paper. That seems thoroughly inappropriate, though, for celebrating an eco-blog’s one year mark. Which is, in EcoOptimism’s case, today. I think a different kind of tally is more interesting — and more useful as a type of gauge indicating where the focus and direction has been. To do this, I had to go back and set up something that, had I known, I should have been doing from the outset: creating “categories” and “tags” for each post. SEO is not one of my strengths. In the blog-as-book metaphor, categories are sort of like the table of contents. Creating tags, I learned, is somewhat akin to creating an index – something I was spared in my book, Sustainable Design: A Critical Guide, where the publisher thought a glossary would be more useful for readers. (FYI, a glossary is much harder to do, but also much more fun. Creating definitions is a bit like playing God.) Once I’d created the “index” and logged which posts referenced the topic or person, the blog software kindly gave me the stats indicating how many occurrences there were for each entry. The software also provided me with a “tag cloud” – apologies if you already know this stuff – that graphically renders the stats by type size. [S]imply solving the energy issue with low-carbon sources … won’t make everything hunky-dory. It won’t solve resource depletion, water shortages, loss of biodiversity or numerous other ecological impacts. Moving away from fossil fuels doesn’t diminish the amounts of materials needed for all the stuff demanded by 10 billion people desiring to live as Americans do. It doesn’t reduce the staggering amounts of material we throw out daily. It doesn’t eliminate the toxic runoff from industrial farming …. It doesn’t change either P or C or T.
I’ll spare you a line by line further analysis of the tags; you can get a visual idea from the tag cloud above. 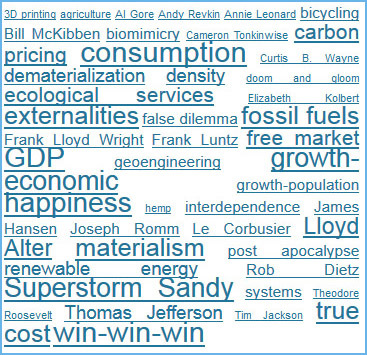 Of note, I think, is that so many of the highest ranked tags relate not to design, but to economics. In addition to the ones already noted, there’s carbon pricing, ecological services, externalities, free market, economic growth, and true cost. As an architect and ecodesigner with a background in economics, I’d like to see more emphasis here on looking at the relationship of the quality of our built environment on environmental impact as well as the quality of the environment on human wellbeing. It’s worth noting that Superstorm Sandy rates a large font in the graphic above, ranking only slightly below the top two ties. Perhaps relatedly, if you were to tally the categories (as opposed to tags) that each post falls under, the clear leader would be “Messaging.” Several of the 68 posts thus far have pondered why environmental issues and causes are having such a difficult time garnering public support: is it a matter of taking the wrong tactics to communicating the problems? How we approach this question goes to a core of EcoOptimism’s purpose. One way that climate disruption or other eco topics will rise to greater attention is when the reality, the fear, sets in. Sandy was seen by many as a harbinger. But clarion calls may come too late. The disruptions set in motion by then may, like the proverbial train, take too long to stop, let alone reverse. EcoOptimism says, rather than build the demand on fear, build it on desire by establishing that the actions we need to take are actually steps that we want to take because, aside from the environmental benefits, they will improve our lives. This entry was posted in Messaging, Uncategorized and tagged consumption, fossil fuels, happiness, Superstorm Sandy, win-win-win on July 12, 2013 by David Bergman.